I ended up taking a couple of days off from blogging, so I’m getting a late start on my round-up of Thanksgiving resources, but this will be pretty quick anyway. 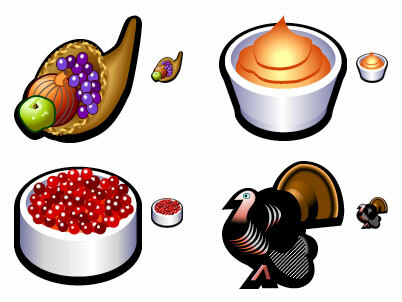 Today I have some free icons for Thanksgiving for you. Available as Windows and Macintosh icons. See the OS X icons – Nature page. Set of 8 Windows icons.